WASHINGTON, DC– The Board invites the filing of briefs in order to allow parties and interested amici the opportunity to address issues raised in United Steel, Paper and Forestry Rubber, Manufacturing, Energy, Allied Industrial and Service Workers International Union, Local 1192 (Buckeye Florida) (12-CB-109654). Among the issues raised by the Board is whether parties and amici believe the Board should adopt a rule permitting unions to collect fees from nonmembers for grievance processing. Briefs from parties and interested amici must be submitted on or before June 15, 2015. This entry was posted in General Union Business and tagged Briefs from parties and interested amici, freeloaders, grievance processing, National Labor Board Charge, NLRB, rule permitting unions to collect fees from nonmembers, scabs. Bookmark the permalink. To aid in the consideration of the issues raised in the case, the Board extended the time for filing of briefs from the parties and interested amici, extending to on or before July 15, 2015. The parties may now file responsive briefs on or before July 29, 2015. I am totally FOR charging NON UNION MEMBERS to process their grievances. 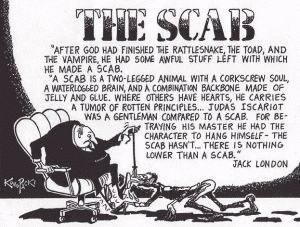 Why should they receive FREE representation when MEMBERS pay their dues! End the free ride for nonmembers.